Marley Natural™, the official Bob Marley cannabis lifestyle brand, made its European debut at the iconic French retailer colette during couture fashion week in Paris. Marley Natural and colette celebrated the occasion at a pop-up developed in collaboration with System Magazine and the fashion design duo Creatures of the Wind. 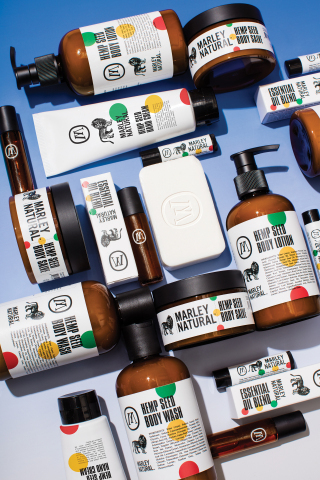 Marley Natural body care products and smoking accessories are available from colette online and in-store at 213 rue Saint-Honoré. In addition to Marley Natural products, the shop will also feature a limited-edition cannabis-inspired collection by Creatures of the Wind and System Magazine’s Issue No. 9, which includes a 140-page portfolio shot by photographer Juergen Teller at a Canadian medical cannabis facility. Drawing on System’s latest issue theme of cannabis, the Creatures of the Wind capsule collection features hand-drawn botanical embroidery by designers Chris Peters and Shane Gabier. The capsule, which is comprised of four styles (parkas, fur coats and one-of-a-kind vintage sweater and t-shirts), is being sold at colette starting on Tuesday, July 4. To view photos from the launch event at colette, visit the Marley Natural website. For additional photographs, visit Getty Images. The Marley Natural body care line offers naturally-derived formulas that blend the moisturizing power of hemp seed oil with Jamaican botanicals, including ginger, lemongrass, turmeric, and cerasse. All formulas contain cold-pressed hemp seed oil rich in essential fatty acids, Omega-3s and Omega-6s. All formulas are paraben, sulfate and cruelty free. Body care products are available for sale via www.MarleyNaturalShop.com. The hemp seed body care products include an essential oil blend, body lotion, body wash, body salve, hand cream, bar soap and a lip balm. Balancing intuitive design with Jamaican-inspired accents, Marley Natural’s smoking accessories cater to discerning herb connoisseurs who celebrate the ritual of smoking. The collection features products made from sustainably sourced American Black Walnut wood and heat-resistant, hand-blown glass, all boxed in 100% recyclable packaging. Each product is designed to ensure durability, convenient maintenance, and a comfortable hand-feel. The accessories are designed to be used only with legal smoking herbs and are not intended to be used with tobacco products. The collection is available for sale at specialty retailers in the United States and Europe, as well as online at www.MarleyNaturalShop.com. The collection includes a taster, a spoon pipe, a steamroller, a bubbler, and a grinder, as well as prep trays and storage devices. System explores with style and substance the dialogues at the heart of the global fashion industry. Its biannual magazine offers exclusive long-format conversations with fashion’s most relevant, most powerful and most opinionated individuals, accompanied by portfolios created by the industry’s most in-demand image-makers. Exploring and commenting on fashion’s constantly shifting landscape, System is a platform for deep thoughts and real opinions – shared within the industry and, in turn, influencing the broader world.